Clarens was incorporated as a town in 1912, the same year that the ‘unsinkable‘ Titanic was launched. Tragically, the Titanic did sink and the event was a major topic of discussion for many months. 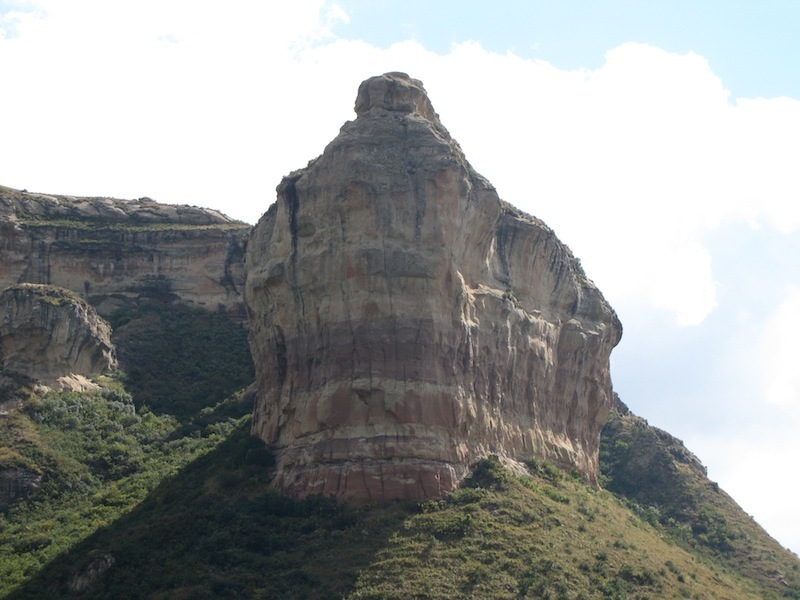 During this time, a resident of the newly established Clarens, looking north from the little town towards Naauwpoort Nek, saw the prominent rock feature there and suggested that it looked like the Titanic, which is what it has been called ever since. Titanic Rock stands, sentry-like, to welcome and protect all who visit the village. Not surprisingly, in view of the beauty of its surroundings, Clarens has become a haven of tranquillity for artists, solitude seekers and nature lovers both from South Africa and abroad. It offers various outdoor pursuits, such as birding, hiking trails, horse riding, 4×4 trails, trout and bass fishing, golf, tennis, squash, bowls and clay pigeon shooting. Various places of historical or archaeological interest are to be found here, including Surrender Hill, dinosaur fossil sites and bushmen paintings in nearby caves. The nearby Golden Gate Highlands National Park is home to a number of unusual lichens that occur nowhere else. The park is named for the unusual geography of the area, typified by striated sandstone cliffs, which turn golden in the rays of the setting sun. The village of Clarens itself has numerous art galleries as well as craft shops, restaurants and coffee shops. Clarens is a key point on the scenic Highlands route, linking the towns of Harrismith, Bethlehem and Fouriesburg. The gateway to the Lesotho Highlands, the Malutis and the Drakensberg, Clarens is also an important stopover for people travelling to and from Gauteng and KwaZulu-Natal to the Cape and vice versa. It is centrally situated, being only three hours from Johannesburg, Pretoria and Bloemfontein and four hours from Durban. The Anglo-Boer War started in 1899. By December 1899 the Boers had beaten the British in three battles – at Stormberg, Magersfontein and Spionkop. This was followed by success at Colenso. The Boers had also successfully besieged Ladysmith, Kimberley and Mafikeng. However, they began to lose the initiative by getting stuck in static battles of attrition rather than using their mobility to push on into Natal after winning at Colenso. This afforded the British the opportunity to build up their forces – which they did, and in quick succession they took Paardeberg, relieved Ladysmith, and captured Bloemfontein, Johannesburg and Pretoria. These British victories affected the morale of the Boers in the Transvaal and many of them returned to their homes and farms. The Free State Boers, however, went on to achieve successes at Lindley and Heilbron and at the Rhenoster River, where the British suffered 1 500 casualties. By mid-June 1900, war operations had started in the Brandwater Basin, an area situated between the town of Fouriesburg and the well-known landmark of Golden Gate. The Brandwater Basin gets its name from the Brandwater River, a tributary of the Caledon River that runs along the foothills of the Maluti Mountains. At that time, British troops numbered 200 000 and the active Boers only 20 000. The Boer morale continued to decline, and there was confusion and uncertainty regarding their leadership. On June 14, Lord Roberts made definite plans to defeat the Boers under Generals De Wet and Steyn in the eastern Free State and on July 6-7 the Boers were defeated at Bethlehem. They decided to retire into the Brandwater Basin. On July 11, 1900, after a council of war, the Boers decided to escape out of the Basin in three groups and at this stage a crisis in leadership manifested itself. There were only a few passes into or out of the Basin. These were Naauwpoortnek in the east, Commando and Generals in the south, Slabberts and Retiefs in the north and the Golden Gate. Over a short period of about six days the British took Spitzkrans, Retief’s Nek, Slabbert’s Nek and Fouriesburg, almost unopposed. They then managed to block Naauwpoort Nek. On July 27, the Boers attempted to retreat from Naauwpoort Nek along the Little Caledon River towards Golden Gate, but they encountered British forces under Macdonald and retreated to Slaapkrans, now known as Surrender Hill. On the night of July 28 the British took Slaapkrans. The Boer Commander Prinsloo attempted to negotiate an armistice and 1 500 Boer troops escaped through Golden Gate. Two days later, 3 000 Boers under Prinsloo surrendered at Verliesfontein on Slaapkrans (Surrender Hill) and, on July 31, 1 500 Boers under Du Plooy, Joubert and Potgieter surrendered at Kirksvlei just beyond Golden Gate. Boer commando weapons were destroyed by burning on Surrender Hill. By August 9, 1900 the British had captured 4 314 men, three field guns and 2 800 head of cattle and they destroyed about 6-million rounds of ammunition. The prisoners were despatched by train to Cape Town and were eventually shipped to Ceylon, Bermuda and St Helena. They were permitted to return to South Africa only if they signed allegiance to the British Crown. Many never did so. Surrender Hill was proclaimed a national monument in 1986. Millions of years ago these parts teemed with many different kinds of animals and plants. Today many are extinct but their remains are preserved as fossils, found in different rock layers that can be up to 240 million years old. There are some exciting fossil sites in the Clarens area, and new ones are still being found. The fossils already discovered show how sizes differed among the dinosaurs. For example, the Massospondylus was about 5m to 6m long; while the Lesothosaurus was only about 90cm long. From fossil records we also know that while Massospondylus walked on four legs it could rear up on its hind legs to feed off foliage high above ground level. This dinosaur swallowed stones to help it to grind the plant material it ate into a pulp in its stomach. Rock art is Africa’s oldest artistic tradition and South African Bushman or San rock art is one of the finest, oldest and most enduring artistic traditions in the world. Most of the art seems to have been made during the last 2 000 years and much of it in the last 800 years, although some sites in Namibia have been dated at between 27 000 and 30 000 years old. Rock art is visual imagery painted onto or engraved out of the rock face. It is an archaeological artefact that tells us about its makers, who they were, where they lived and what they thought and did. Bushman rock art is also highly symbolic and religious. Shamanism centres on a belief in a spiritual world that exists behind the rock and which medicine people or shamans could travel to in order to heal, make rain, fight evil and so forth. Functioning as both homes and sacred spaces, the rock art shelters are monuments to the lives and spirituality of the Bushmen. There are over 25 000 rock art sites throughout South Africa. Many of these are in the vicinity of Clarens, Golden Gate and the Maluti Mountains, with several exceptional rock art sites close to Clarens. Guides are available to assist visitors and in many cases visitors are able to make their own way to the sites. Rock art is an irreplaceable treasure that must be looked after and protected.